The number and or concentration of alcoholic beverage establishments may be limited by the City Commission if it determines that any such establishment or concentration of establishments will be detrimental to the city’s downtown redevelopment plan or to the general effort of the city to eliminate slum and blight within such area. Whether the proposed use will result in a concentration of such uses within a particular block or part of a block so as to be detrimental to the growth and revitalization of downtown. Whether the proposed use is in close proximity to other land uses that may be particularly sensitive or unduly harmed by the negative impacts of the proposed use, such as facilities for children or for the elderly. Whether the size or scale of the proposed use is appropriate at the specific location. Whether the owners and operators of the establishment are unlikely to manage and control negative impacts as evidenced by prior criminal records, code enforcement citations or police service calls concerning other properties owned or operated by them, citizen complaints, or similar indicators. Whether the Board of Directors of the Lakeland Downtown Development Authority supports the proposed use. Other criteria which the City Commission shall consider appropriate in the particular case. Applicants must complete the following application and request an appearance before the LDDA board for application review and decision. The applicant must also apply with the city of Lakeland for a conditional use. 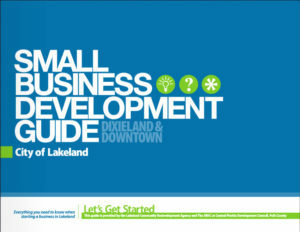 Please use the Small Business Development Guide as a reference. The City’s conditional use application is linked here.